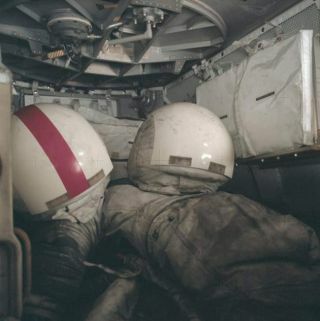 Dusted and dirty helmets and space suits stowed inside Lunar Module after final Apollo 17 moonwalk in December 1972. Thealien and perilous dust on the moon has prompted scientists to ponder lunarhealth standards that would be set before astronauts go there again. Adiverse team that includes flight surgeons, industry air quality experts, toxicologists,lunar geologists, and even an astronaut is examining how harmful lunar dustcould be to humans. ?Lunardust is unlikeany kind of dust we?re used to breathing on Earth,? said Noreen Khan-Mayberry,space toxicologist at NASA?s Johnson Space Center in Houston, Texas. Sheand other members of the Lunar Airborne Dust Toxicity Advisory Group (LADTAG) havesome concerns about the toxicity of the chemically reactive lunar dust grains,which also contain nano-particles of natural metal and glass shards formed froma combination of chemical reactions, meteorite impacts and solar windbombardment. LADTAGwill help NASA set health standards for astronaut exposure to the dust — anecessary step for designing the spacecraft, rovers, and habitats that willreturn humans to the moon. Whenthe first Apollo astronauts stepped ontothe moon, one of the lesser problems they were expecting was dust. But theysoon found the gray stuff clogging up instruments and causing breathing andvision problems inside the lunar lander. AlanBean, Apollo 12 astronaut, noted that trying to brush the dust off only rubbedit deeper into their spacesuits. That clinginess comes from both the barbedshapes of lunar dust grains and an electrostatic charge built up by solar windexposure, because the moon lacks a protective magnetic field like the one thatshields Earth. Lunardust consists of uneven rock grains too small for the human eye to see. The constantbombardment from solar radiation has left them porous like ?swiss cheese,? saidJohn James, chief toxicologist for NASA at the Johnson Space Center andco-chair of LADTAG. Thegrains range from spherical to highly angular shapes, remaining sharp andunworn by any wind or other natural processes. ?It?sthe glassy properties and jagged shape that create abrasiveness,? James said,adding that the ?sandpaper? effect could damage spacecraft hardware andspacesuits. TheLADTAG team wants to examine how such an effect could similarly damagesensitive human skin and eyes, Khan-Mayberry noted. Themoon?s near-vacuum environment also leaves lunar dust grains covered with chemicallyreactive bonds which would normally become neutralized through interaction withatmospheric gases such as oxygen. That means they might react in highly toxicways when breathed into the lungs, although scientists hope that the dust will becomeless threatening in a lunar habitat after reacting with the indoor air. LADTAGresearchers test such exposure in two ways. One method injects fluid mixed withlunar dust into the lungs of an anesthetized lab mouse or rat, while anothermethod puts lab animals in cylinders containing lunar dust to watch them inhaleit normally. Thesecond method better simulates how astronauts might breathe in lunar dust, butit also requires more of the ?finite? lunar dust supply brought back from themoon, Khan-Mayberry said. The LADTAG team may eventually resort to grindingdown larger lunar dust samples to add to the supply. Figuringout the quirks and characteristics of lunar dust has proven a team-buildingexercise that combines geological studies with medical knowledge. ?What?sreally made this interesting is getting lunar geologists and toxicologists tocommunicate,? said James. ?I think we?re going to come up with some reallyremarkable stuff from our interaction.? LADTAGplans to present its findings to NASA around 2010, which will hopefully allowthe space agency to set health standards for astronauts who may work aroundlunar dust. That would also push engineers to design habitats and rovers thatcould keepdust out, and maybe even put lunardust to good use. However,the group?s work won?t end there — members will tackle the next challenge ofMars by reorganizing as MADTAG.